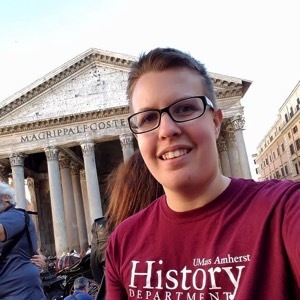 Shay Olmstead is a Ph.D. student studying the history of queer and (trans)gender policies in the mid-twentieth Century United States. Their current research examines transsexuals who brought employment-discrimination lawsuits against their employers in the 1970s. Shay received their Bachelor's degree in American Indian Studies from Black Hills State University in Spearfish, South Dakota and went on to receive both a M.Ed. in Curriculum and Teaching from Fitchburg State University and a M.A. in History from the University of Massachusetts Amherst. In their spare time, Shay can be found training and showing at local dog trials, speaking for the UMass Amherst Stonewall Center Speakers Bureau, or just hiking, baking, and otherwise enjoying life in the Pioneer Valley. They use the pronouns they/them/theirs.